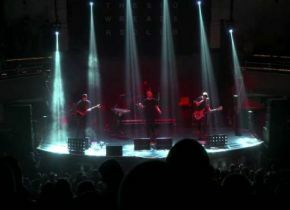 The Slow Readers Club have shared a new live video for their latest single, ‘You Opened Up My Heart’, filmed at their sold out Manchester Albert Hall show last year. The track is taken from their third album, Build A Tower, out May 4th via Modern Sky. Encapsulating the captivating energy of the band’s live performance, the video sees the band perform the track to a packed out crowd of over 2,000 enthralled fans. It follows the release of the official video; a pulsating collage of glitchy visuals and atmospheric ambience. ‘You Opened Up My Heart’ is the latest single from the upcoming album, following the tracks ‘Lunatic’ and ‘Through The Shadows’, both of which feature on the new album. The band will be touring the UK in support of Build A Tower, starting this week in Cardiff and continuing throughout May. Leeds, Northwich, Manchester and Stoke have sold out, with Manchester selling out in less than 24 hours. Full dates can be found below.